The present research uses self-determination theory to examine whether autonomous and controlled regulation of performance-approach (PAp) goals would differentially predict educational outcomes and add to the variance explained by the goal strength. Two cross-sectional studies among 10th to 12th grade students supported this hypothesis but showed that when regulations of PAp goals were entered into the same regression equation with the PAp goal strength, the PAp goal strength no longer predicted outcomes. 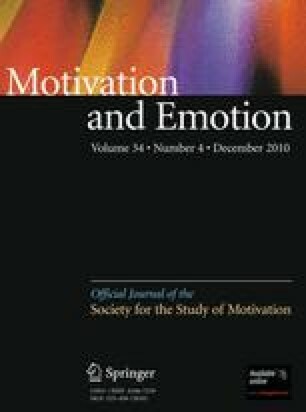 Study 2 examined perfectionism in relation to PAp goals and types of regulation, thereby showing that whereas adaptive and maladaptive perfectionism were both positively related to PAp goals, adaptive and maladaptive perfectionism were associated with autonomous and controlled regulations, respectively. Finally, path modeling indicated that autonomous and controlled regulations of PAp goals (but not PAp goals themselves) accounted for nearly all of the relation between the types of perfectionism and learning outcomes. The discussion emphasizes that it is critical to move beyond the consideration of PAp goals per se, thereby considering the types of regulation of PAp goals. We would like to thank Ellen Duyck for her fantastic help in collecting the data.